The name which is a symbol of supersonic air travel & luxury. The aircraft which changed the course of history. With maximum speed of 2,180 km/h (Mach 2.04) at maximum cruise altitude of 68,000 ft. There were 20 aircrafts were built. It is one of only two supersonic transports to have been operated commercially; the other is the Soviet-built Tupolev Tu-144. Concorde's name, meaning "harmony" or "union", was chosen to reflect the co-operation on the project between the United Kingdom and France. On 2rd March 1969 This legendary aircraft Concorde 001 took off from Toulouse and reached 10,000ft; a mile stone in history of the aviation. Unfortunately after flying for 27 Supersonic years. On 24 October 2003, Concorde was retired after a deadly accident of Air France Concorde took place on 25 July 2000 while taking off from Paris for New York with 100 passengers & 9 crew on-board. Concorde reduced transatlantic crossing to 3.5hrs while airliners at the time used to take 8hrs for the same. She Brought Cities Together; She Brought People Closer & reminded us all that we can do extraordinary things. This specific stamp was issued on 3rd March 1969 (48 years old) in Britain designed by David Gentleman - A British artist, along with 2 other stamps, a day after the Concorde made its first successful flight making this Commemorative event of Concorde First Flight. With one design (4d) by M. and S. Goaman and the other two (9d and 1s 6d) designed by the prolific and imperious David Gentleman. 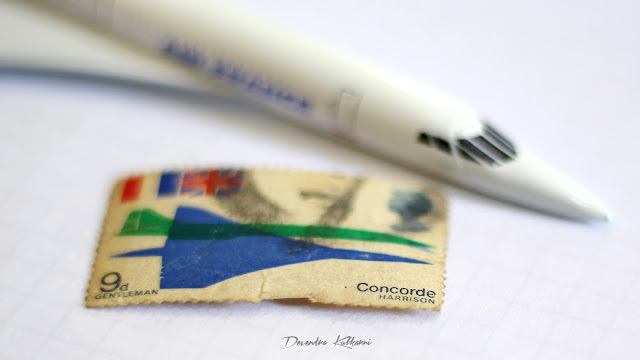 The stamp features design of Concorde with very simple illustration of Concorde design on it. Thanks to my friend Michael Fernandes for this. Even today it is an aviation and engineering icon, with hope to see this legendary bird flying ones again...Concorde will always be remembered among us.